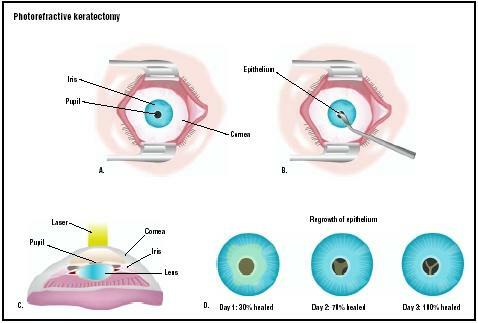 Photorefractive keratectomy (PRK) is a noninvasive refractive surgery in which the surgeon uses an excimer laser to reshape the cornea of the eye by removing the epithelium, the gel-like outer layer of the cornea. PRK, one of the first (and once the most popular) refractive surgeries, eliminates or reduces moderate nearsightedness (myopia), hyperopia (farsightedness), and astigmatism; it is most commonly used to treat myopia. Successfully treated PRK patients no longer require corrective lenses, and those who do still require correction, require much less. PRK is an elective, outpatient surgery , and people choose the treatment for different reasons. Some simply no longer want to wear eyeglasses for cosmetic reasons. Sports enthusiasts may find eyeglasses or contact lenses troublesome during physical activities. Others may experience pain or dryness while wearing contact lenses, or have corneal ulcers that make wearing contact lenses painful. Firefighters and police officers may have trouble seeing in emergency situations when their contact lenses get dry or their eyeglasses fog up. of Ophthalmology (AAO) estimates that 95% of all refractive surgeries are LASIK. The first PRK patients are sometimes referred to as "early adopters." These are people who are always interested in the latest technology and have the financial resources to take advantage of it. In the mid-1990s when PRK was first approved, patients were in their early 30s to mid-40s and financially stable. Prices have now stabilized at about $2,500 per eye for PRK. While it has lost favor with the general public, PRK is the choice of the United States military. Military doctors prefer PRK over LASIK because the latter involves cutting a flap that doctors fear may loosen and become unhinged during combat. PRK was first performed in the 1980s and widely used in Europe and Canada in the early 1990s, but was not approved in the United States until 1995. PRK was the most popular refractive procedure until the creation of LASIK, which has a much shorter recovery time. PRK is still the preferred option for patients with thin corneas, corneal dystrophies, corneal scars, or recurrent corneal erosion. PRK takes about 10 minutes to perform. Immediately before the procedure, the ophthalmologist may request corneal topography (a corneal map) to compare with previous maps to ensure the treatment plan is still correct. Ophthalmic personnel will perform a refraction to make sure the refractive correction the surgeon will program into the excimer laser is correct. Patients may be given a sedative such as Valium to relax them before the surgery. Anesthetic drops will be applied to numb the eye and prevent pain during the procedure. After the eye drops are inserted, the surgeon prepares the treated eye for surgery. If both eyes are being treated on the same day, the non-treated eye is patched. The surgeon inserts a speculum in the first eye to be treated to hold the eyelids apart and prevent movement. The patient stares at the blinking light of a laser microscope and must fixate his or her gaze on that light. The patient must remain still. The surgeon double-checks the laser settings to make sure they are programmed correctly for the refractive error. With everything in place, the eye surgeon removes the surface corneal cells (epithelium) with a sponge, mechanical blade, or the excimer laser. With the epithelium completely removed, the surgeon will begin reshaping, or ablating, the cornea. This takes 15–45 seconds, and varies for refractive error; the stronger the error, the longer the ablation. Patients may worry that moving could cause irreversible eye damage, but they should know that, at the slightest movement, the doctor immediately stops the laser. When the ablation is completed, the surgeon places a bandage contact lens on the treated eye to protect it and allow the healing process to take place; it also eases some of the pain of the exposed cornea. The surgeon will also dispense anti-inflammatory and antibiotic eye drops to stop infection and reduce pain. Patients should have a complete eye evaluation and medical history taken before surgery. Soft contact lens wearers should stop wearing their lenses at least one week before the initial exam. Gas-permeable lens wearers should not wear their lenses from three weeks to a month before the exam. Contact lens wear alters the cornea's shape, which should be allowed to return to its natural shape before the exam. Patients should also disclose current medications. Allergy medications and birth control pills have been known to cause haze after surgery. Physicians will want to examine the potential risks involved with these medications. Physicians will perform a baseline eye evaluation, including a manifest and cycloplegic refraction, measurement of intraocular pressure (to determine if the patient has glaucoma), slit-lamp biomicroscopy, tear film evaluation, corneal topography, evaluation of corneal thickness, dilated fundus examination, and measurement of scotopic pupil size. If the patient is an appropriate candidate, he or she must sign an informed consent form that states he or she is aware of possible complications and outcomes of the procedure. The patient is advised to discontinue contact lens wear immediately and refrain from using creams, lotions, makeup, or perfume for at least two days before surgery. Patients may also be asked to scrub their eyelashes for a period of time to remove any debris. Patients usually have follow-up appointments at 24 hours, four days, one week, one month, three months, six months, and then annually following PRK. More frequent visits may be necessary, if there are complications. Patients should refrain from strenuous activity for at least one month after surgery. Creams, lotions, and makeup must also be avoided for at least two weeks. The bandage contact lens is removed by the surgeon usually after four days (during the second visit). Patients must be diligent in using antibiotic drops and steroid drops. Because the epithelium is completely removed, there is a greater chance of infection and pain; the eye drops are needed to minimize these possible complications. The eye drops must be used for at least four months for some patients. The slow healing process is imperative to keeping the desired correction. PRK has a long recovery rate, which is why LASIK gained popularity so quickly. Unlike LASIK, in which patients notice improved vision immediately and are back to normal routines the next day, PRK patients are advised to rest for at least two days. PRK patients also experience moderate pain the first few days of recovery, and may need pain relievers such as Demerol to ease the pain. Vision also fluctuates the first few weeks of recovery as the epithelium grows back. This can cause haze, and patients become concerned that the surgery was unsuccessful. PRK patients need to be aware that vision can fluctuate for as long as up to six months after surgery. Incorrect use of eye drops can cause regression. PRK patients may experience glare, vision fluctuation, development of irregular astigmatism, vision distortion (even with corrective lenses), glaucoma, loss of best visual acuity, and, though extremely rare, total vision loss. A more common side effect is long-term haze. Some patients who have aggressive healing processes can form corneal scars that can cause haze. With proper screening for this condition and with the use of eye drops, this risk can be lessened. Complications associated with LASIK, such as photophobia, haloes, and dry eye, are not as common with PRK. However, The patient may be under-corrected or overcorrected, and enhancements might be needed to attain the best visual acuity. Most PRK patients achieve 20/40 vision, which means in most states they can legally drive a car without vision correction. Some patients will still need corrective lenses, but the lenses will not need to be as powerful. There have been reports of regression after the PRK healing process is completed. Sometimes a patient will require an enhancement, and the surgeon must repeat the surgery. Patients should also be aware that with the onset of presbyopia after age 40, they will probably require vision correction for reading or close work. Information about PRK mortality and morbidity is limited because the procedure is elective. Complications that can lead to more serious conditions, such as infection, are treated with topical antibiotics . There is also a chance the patient could have a severe reaction to the antibiotics or steroids used in the healing process. Because these patients only have mild to moderate myopia, hyperopia, or astigmatism, they can choose from most refractive surgeries and non-surgical procedures. Laser in-situ keratomileusis (LASIK). The most popular refractive surgery, it is similar to PRK, but differs in how it reshapes the cornea. Instead of completely removing tissue, LASIK leaves a "flap" of tissue that the surgeon moves back into place after ablation. LASIK is less painful with a shorter recovery time. However, there are more complications associated with LASIK. Radial keratotomy (RK). RK was the first widely used surgical correction for mild to moderate myopia. The surgeon alters the shape of the cornea without a laser. This is one of the oldest refractive procedures, and has proved successful on lower and moderate corrections. Astigmatic keratotomy (AK). AK is a variation of RK used to treat mild to moderate astigmatism. AK has proved successful if the errors are mild to moderate. Contact lenses and eyeglasses also can correct refractive errors. Improvements in contact lenses have made them easier to wear, and continuous-wear contact lenses, which a patient can sleep in for as long as 30 days, can provide a similar effect to PRK. A customized rigid gas-permeable contact lens is used for orthokeratology (Ortho-K), in which a patient wears the lens for a predetermined amount of time to reshape the cornea. After removing the lens, the patient's vision is improved and remains improved until the cornea returns to its natural shape. At that time, the patient repeats the process. See also Laser in-situ keratomileusis (LASIK) . Brint, Stephen F., Dennis Kennedy, and Corinne Kuypers-Denlinger. The Laser Vision Breakthrough. Roseville, CA: Prima Health, 2000. Caster, Andrew I. The Eye Laser Miracle: The Complete Guide to Better Vision. New York, NY: Ballantine Books, 1997. Slade, Stephen G., Richard N. Baker, and Dorothy Kay Brockman. The Complete Book of Laser Eye Surgery. Naperville, IL: Sourcebooks, Inc., 2000. American Academy of Ophthalmology. P.O. Box 7424, San Francisco, CA 94120-7424. (415) 561-8500. http://www.aao.org . American Society of Cataract and Refractive Surgery. 4000 Legato Road, Suite 850, Fairfax, VA 22033-4055. (703) 591-2220. E-mail: http://ascrs@ascrs.org. http://www.ascrs.org . Council for Refractive Surgery Quality Assurance. 8543 Everglade Drive, Sacramento, CA 95826-0769. (916) 381-0769. E-mail: http://info@usaeyes.org. http://www.usaeyes.org . Bethke, Walt. "Surface Procedures: The State of the Art." Review of Ophthalmology, February 2003 [cited March 16, 2003]. http://;www.revopth.com/index.asp?page=1_283.htm . "Identify Allergies Before Performing LASIK, PRK." Ocular Surgery News. October 25, 2002 [cited March 16, 2003]. http://www.osnsupersite.com/view.asp?ID=3802 . "PRK: Photorefractive Keratectomy." EyeMdLink.com . [cited March 20, 2003]. http://www.eyemdlink.com/EyeProcedure.aspEyeProcedureID=7> . Sabar, Ariel. "Laser Gives Kids Vision to Fly." The Baltimore Sun. February 27, 2003 [cited March 16, 2003]. http://www.sunspot.net/features/health/bal-te.ar.laser27feb27,0,3705843.story?coll=bal-home-headlines . Segre, Liz. "PRK: The Original Laser Eye Surgery." All About Vision. [cited March 16, 2003]. http://www.allaboutvision.com/visionsurgery/prk.htm . An ophthalmologist performs PRK with the aid of ophthalmic technicians and nurses. The surgeon may have received specific refractive surgery training in medical school, but because it is a relatively new procedure, older surgeons may not have completed such training. Instead, these surgeons may have completed continuing medical education courses or may have had training provided by the laser companies. Preparation and aftercare may be handled by an optometrist who works with the ophthalmologist on these cases. The optometrist usually establishes eligibility for PRK, and may also perform much of the follow-up, with the exception of the first post-PRK visit. Hospitals are one setting for this surgery, but the most common location is an ambulatory surgery center or surgery suite. Surgeons at surgery centers owned by refractive surgery companies also perform PRK. These businesses hire support staff, optometrists and surgeons in a stand-alone surgery center or in a hospital. Why do you believe that PRK is the correct refractive surgery for me? How many PRK procedures have you performed? Is PRK your preferred procedure? How well will I see after the surgery? How many of your patients experience serious complications? Who will treat complications, if any, after the procedure? How long with the recovery process take? Do I need to limit my activities? article on PRK for Jimmy to look at and read before going down To Wilford Hall in San Antonio TX. Jimmy - Read this about the PRK Procedure you are going to do. There is a section there on some questions you should ask the doctor. You can ask these on your pre-op visit. Also don't forget to tell them about your allergies. Note that PRK is experiencing a resurgence in popularity because the long-term complications and risks of PRK are generally lower: corneal integrity is less affected, flap complications are nonexistent, and lifelong annoyances of halos and dry eye are less common. LASIK is still popular however due to the much faster recovery. i have done my prk 7 months ago.. still having the blurring vision? ?i wanto know how the blurring vision will go? DONT KNOW HOW LONG DO I HAVE TO WAIT.CANNOT READ CLOSER VISION..WILL IT BE CLEARED?? I just had PRK last Monday (8 days post op)on day 5(Friday) my optometrist removed my left bandage. My eye was in terrible pain, I thought it was because it was extremely dry, as he didn't put lubricating drops in my eye. I went home applied drops in hope that it would help. My eye was still in extreme pain, tearing, scratching sensation. I returned to the Doctor and he put the lens back in - instant relief!!! I guess my eye wasn't totally healed. Now I have been advised to keep the contact bandages in for another week. Could he have damaged my eye? I have noticed that my left eye has regressed incredibly since the bandage was removed and reinserted on the Friday. Is this normal healing? He just removed the contact bandage with his fingers, is this normal practise? PRK is probably your best choice not only for the military reasons, but also like papi, you probably have a thin cornea. I am sure it will be successful, and it is in the Navy's best interests to have a high success rate of these procedures. I have my PRK surgery in two days. I was wondering how much sleep i need to get before the surgery and if im allowed to take any pain meds the day before for a headache. What if the surgery get worse than it already is can they still correct it? Had successful cataract surgery several months ago. Vision in one eye is 20-20, 20-40 in the other. Is it worth the risk of PRK to correct the 20-40 to 20-20? I have a stupid question. So, I got my PRK in Germany and now I am temporarily in California for 2 weeks, which is 9 hours behind. My steroid medication states that I must take it 4 times a day and I can't skip any doses. In Germany, I set an alarm for Breakfast, Lunch, Dinner, and Bedtime. But now that I am in CA, those times are all during sleeping hours. Should I continue to take my drops on German time or what? Actually, I should change my drop schedule to every 6 hours. I had PRK in may 2011 about 5 months ago. my starting vision was 20/200 in both eyes. before the surgery i just slept like any other night and went in for the surgery it only took about 30 seconds and eye where you will smell a little burning. After the surgery they urge you to sleep as much as you can to relieve pain and help with healing also consume as much Vitamin C as possible. I had blurry vision for about the first seven days and it started to clear within 2 weeks. The contact bandages were removed by the doctor after 7days also,. The first couple days i did feel some pain and it was annoying because my eyes did itch pretty bad. After the first 2 weeks, i went back to the doctor and my vision was 20/60 in my right eye and 20/40 in my left eye. After my 5th visit to the doctor at about 2 months after my PRK i went to the doctor and i had 20/15 in both eyes. Currently my vision is crystal clear and i have no problem with dry eyes or and pain or anything. The eye doctor advised me that i healed very quickly but it is a slow healing process. I am only 23 years old and the doc said this is why my surgery went so successfully because as with age vision gets worse in most cases. I had PRK with Dr. Tylock in Irving Texas exactly 4 months ago and never have a clear vision day since then. Today doctor told me that I was over corrected so now I am far sight +1.75. More likely I need to come back for an enhancement procredure in two month. I read somewhere that the second procedure will be more dangerous than the first one and less chance for me to have a 20/20 vision. I would appreciate any comments in this regard. Thanks. I had PRK with Lasik MD in Vancouver 6 months ago and still have unstable blurred vision in low light and dry eyes which mean that I have to wake up to put drops in 2-3 times per night. They have now informed me that the dry eyes will be permanent. I was not given the information I needed to make an informed decision and misled regarding the potential complications despite a direct appeal for such information. DO NOT have laser eye surgery and do not trust LASIK MD, as they do not have their patient's interests at heart. How soon after PRK is it safe to get pregnant? Is it once you have stopped taking eye meds/drops? I had PRK done 15 years ago. For the first 10 years everything was great (except for relying on eye drops to stop the dryness). I knew after about 10 years I would have to wear corrective glasses again because of my age (Myopia set in). The problem I am having now since a few years are my eyes ache and are severely dry and I have terrible terrible headaches behind the eyes (especially one). Driving at night is terrible and my eyes always feel hazy. I cannot read or stand brighter lights. My eye doctor has had me on steroids for a bit but my troubles seem to constantly reoccur. I definitely would have not gotten this procedure done had I known of the complications. There was so many advertisements saying it was a safe procedure but no one could know about the long term effects ! I feel I was a guinea pig :( Don't do it !!! I am considering a touch up to my PRK of 9 years ago. They say that ones eyes will go downhill with aging regardless of the PRK surgery. Don't know if I should just leave it be and wear glasses. I am one day post_op PRK. The pain is unbearable to me. Anyone else experience this and did anyone receive meds for pain?